Students may earn an M.S. or Ph.D degree with emphasis in geophysics. Successful students gain an advanced theoretical and applied geophysics education, both in the classroom and in the field, built on a strong geology and physics foundation. Most incoming students have undergraduate degrees in geology, physics, or geophysics, but we encourage students with backgrounds in mathematics, computer science, or engineering also to apply. 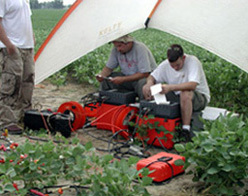 The department has extensive state-of-the-art geophysical field instrumentation and computer facilities. "The Geology/Geophysics graduate program offers maximum student-faculty interaction in dynamic teaching and research."